Be the first to share your favorite memory, photo or story of Marvel. This memorial page is dedicated for family, friends and future generations to celebrate the life of their loved one. 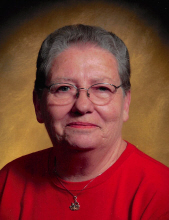 Marvel Vonnie (Johnson) Haas age 80 of Canby, MN peacefully entered the gates of Heaven on Thursday, January 24, 2019 in Sioux Falls, SD surrounded by her family. Funeral Service will be 10:30 a.m. on Tuesday, January 29, 2019 at Our Saviour’s Lutheran Church in Canby, MN. Burial will be at the Canby City Cemetery in Canby, MN. Visitation will be from 4:00 – 7:00 p.m. with a 7:00 p.m. Prayer Service on Monday, January 28, 2019 at the Houseman Funeral Home, Birk Chapel in Canby, MN. Her story starts on August 14, 1938 in Oshkosh Township. She was the only daughter of John Johnson and Evelyn (Lueders) Johnson/Dahl. She was baptized at St. Stephens, Canby and received her first communion and was confirmed at Our Savior’s Lutheran Church, Canby. On April 23, 1954, she married Leo Haas in Canby, MN to this union three children, Sheila, Wanda, Terry, were born. Keeping her memory alive are her children, Wanda Winter and Terry (Karol) Haas; fourteen grandchildren, Jamie (Lisa) Lokken, Melissa (Keith) Helgeson, Ron Jr. (Angela) Winter, Jody (Shaun) Vernlund, Doug (Julie) Winter, Jennifer (Jesse) Engesmoe, Tammy (Nathan) Johnson, Kelly (Steve) Gagnon, Markeela (Matt) Toreen, Lacie (Keith) Petersen, Chaske (Tasha) Faulk, Brittany (Jarrett) Pridal, Chelsea (Jamie) Mosier and Shonteera Haas; thirty-four great-grandchildren, Shauna (Preston), Emma & Alexa Vernlund, Blake & Ashton Helgeson, Chantz, Evan & Rona Engesmoe, Avery & Hailey Lokken, Courtney, Andrew & Abbie Winter, Gwyneth, Ian & Lucy Winter, Bailey & Aleah Johnson, Easton Gagnon, Eliana, Jaxton, Emerly & Henley Petersen, Kyra, Keagan, Sophie & Addie Toreen. Silis, Rodriek, Ryder & Baby Girl Faulk, Briella Pridal, Owen & Baby Girl Mosier; and her best friend Lucy Hansen. She was welcomed into heaven by her parents; her husband, Leo Haas; her daughter, Sheila Lokken; son-in-law, Sheldon Lokken; son-in-law, Ron Winter Sr.; and great-granddaughters, Elizabeth Lokken & Braylee Pridal. To plant a tree in memory of Marvel Haas, please visit our Tribute Store. A Prayer Service will begin at 7:00 p.m.
"Email Address" would like to share the life celebration of Marvel Haas. Click on the "link" to go to share a favorite memory or leave a condolence message for the family.